After Sandy, Questions Linger Over Cellphone Reliability : All Tech Considered Roughly one in four cellphone towers in the path of Hurricane Sandy went out of service. It was a frustrating and potentially dangerous experience for customers without a landline to fall back on. Now, local officials and communications experts are pushing providers to improve their performance during natural disasters. 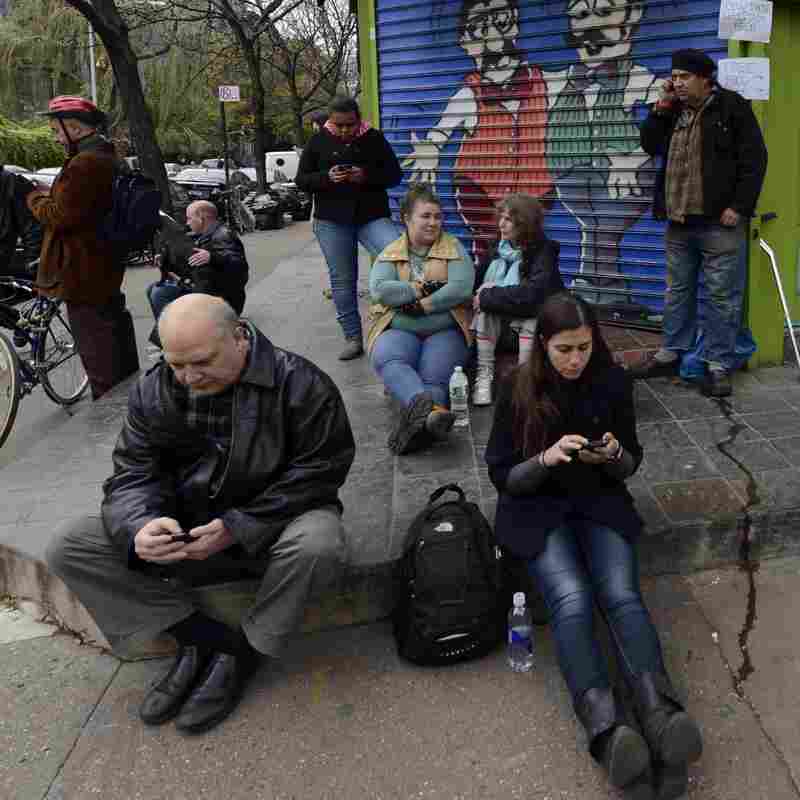 Residents of the East Village in New York City look for cellphone reception Nov. 1 after Hurricane Sandy wiped out power and some cell towers. Roughly one in four cellphone towers in the path of Hurricane Sandy went out of service. It was a frustrating and potentially dangerous experience for customers without a landline to fall back on. Now, local officials and communications experts are pushing providers to improve their performance during natural disasters. Lori McCaskill lives in Brooklyn, and when Sandy hit last October, her Verizon cell service went out. She couldn't work. She couldn't check in with family and friends. Her sister was due to have a baby any day. "I realized, oh, if there's actually an emergency, I don't know if a call would get through," she says. In the city of Long Beach, N.Y., all the cell towers went down during Sandy. City Manager Jack Schnirman described the experience at a recent Federal Communications Commission hearing on how cellphone networks held up, or didn't, during the storm. "There was one woman in particular who passed away, of natural causes, an elderly woman," he said. "And her daughter had to walk literally a mile and a half from her home to police headquarters just to say, 'Listen, my mom has passed, and I thought I should tell somebody.' "
To prepare for the next disaster, Schnirman wants better access to "Cell on Wheels," or COWs. They're cell towers that can be moved from place to place. He wants backup power, like generators, at cell towers. And he wants better access to the cell providers themselves. He said he didn't even know whom to call during Sandy. "The city's IT department flagged a Verizon tech off the street to help us find out who in Verizon could help; we needed to get somebody to come and help us," Schnirman says. One of the problems is that cell companies, unlike power companies, are not required to tell the public where their networks are down or how many customers are affected. Susan Crawford, a professor at Cardozo Law School, says assumptions that competition would force the carriers to provide reliable service are wrong. "We assumed that cable would compete with phone, phone would compete with wireless, and that therefore we didn't need to have this whole superstructure of regulation," she explains. "It turns out that we were wrong." These problems are growing as more and more people drop their landline phone service. Currently, more than a third of households rely solely on cellphones. Crawford's home is among them. "I'm speaking to you on a cellphone because I don't have a landline at home," she says. After 2005's Hurricane Katrina, federal regulators did try to mandate that each cell tower have backup power. But the carriers challenged that rule in court and it was rolled back. Crystal Davis works in crisis communications for Sprint Nextel, the only major carrier that agreed to be interviewed about Sandy. She says a battery typically provides about four to six hours of additional power to a cell site. "In terms of a permanent generator, that can give you an extra day or two," she says. The problem is, in some places after Sandy the power was out for weeks. Jamie Barnett, the former chief of the FCC's Public Safety and Homeland Security Bureau, says backup power aside, there's a bigger issue here. As many calls move from copper wires onto the Internet, Barnett says, the FCC's role is in question. "The carriers have questioned whether or not the FCC has authority over broadband, basically Internet-based communications," he says. "Well, that's the way all communications are moving." Barnett says most calls these days — landline and cellular — will be processed through the Internet at some point. So he thinks limiting the FCC's authority over broadband would be a big deal, and could lead to a lot more instances of "can you hear me now?"